What is erosion, and how can I stop it? This page goes over the causes of erosion and highlighs techniques and smart landscaping strategies to minimize erosion on your property. Erosion is the process of soil movement primarily by WATER or WIND. Raindrop Erosion is when soil is loosened and detached by the impact of rain drops. This is dependent on the amount, intensity, duration and frequency of a rainfall event. Raindrop / splash erosion (Source: Hillsdale Community Center, 2017). Surface runoff is the process where water during rainfall events accumulates along the surface and travels towards the watercourse. When water travels down the face of an exposed slope in concentrated paths deep furrows or rills can form (see photo below). When this concentration is severe enough multiple rills can combine and form into a larger gully that looks like a v-shaped depression. Bank Erosion is the wearing away of any stream or river bank due to fluvial erosion (direct removal of soil particles by flowing water) or mass failure (when the weight of the bank exceeds the strength of the soil, causing the bank to collapse). Riverbank erosion threatening a public works yard (Source: TRCA, 2014). Shore Erosion is caused by the striking action of strong waves within lakes and seas against unprotected shorelines. Vigorous waves can be accelerated by strong winds causing further damage to the shore line. Back shore erosion along Lake Ontario (Source: TRCA, 2017). Saltation is the primary means of soil movement and it consists of wind moving fine particles across land causing damage to soil surfaces. Creep (rolling) occurs when large sized soil particles that are too heavy to be suspended by the wind roll over an area and come in contact with particles undergoing saltation. Suspension occurs when the wind takes very fine particles of soil and moves them over long distances. Soil movement types from wind erosion (Source: Heidorn, 2002). 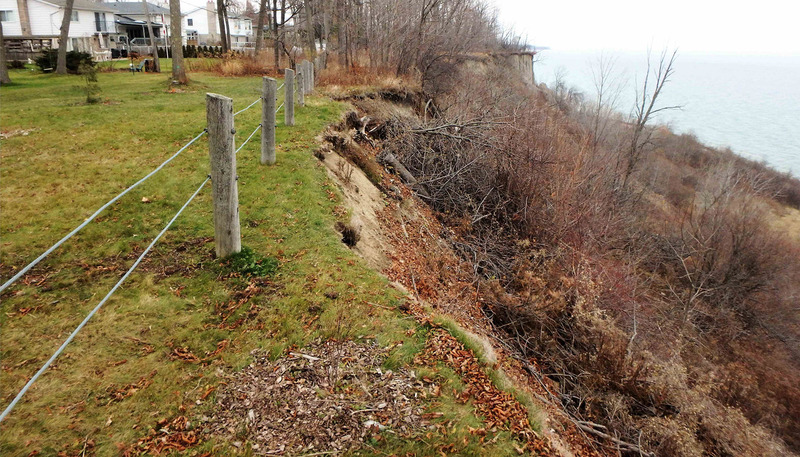 Excessive surface water runoff is one primary cause of erosion and slope instability on ravine and bluff slopes. Uncontrolled and concentrated drainage of stormwater over the slope can lead to rills and gullies and saturate and weaken the soil. Downspouts discharging towards the ravine, grading of the landscape, or other factors can direct stormwater to the edge of a ravine or bluff and create gullies. There are multiple stormwater management techniques and low impact development measures that can help minimize these concerns. You can read more in this guide prepared by the Sustainable Technologies Evaluation Program. Some basic measures involve disconnecting downspouts from the municipal storm sewer system and installing rain gardens to collect/absorb water. 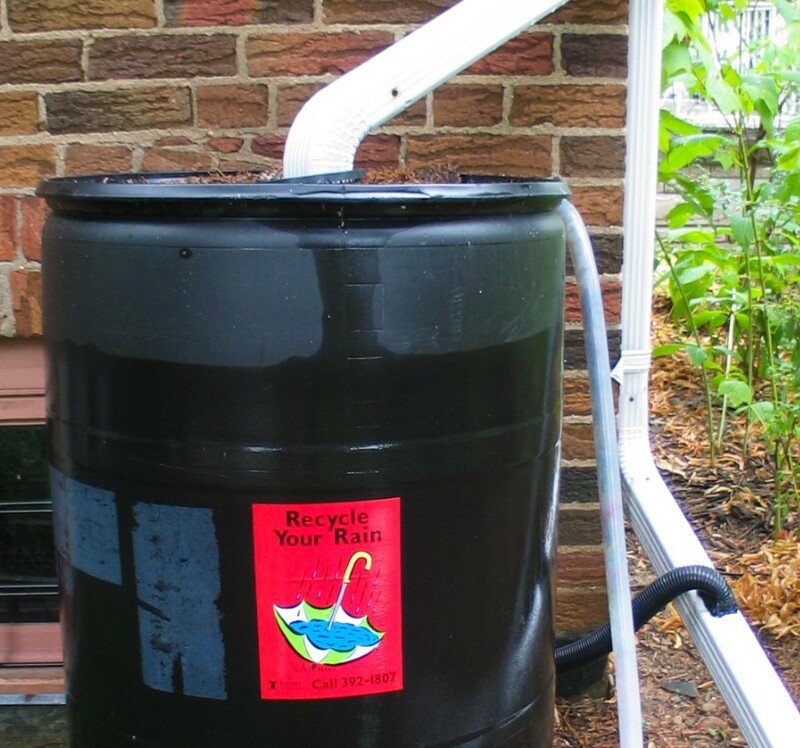 A rain barrel can also be connected to the end of a downspout to harvest rain water thereby reducing municipal water bills and erosive potential. If you have a pool, make sure the water is drained via a hose leading to the street catch basins and repair any leaks immediately as they may damage the underlying soil. Dumping of yard waste including logs, branches, grass clippings and leaves onto the slope face kills the underlying vegetation and seedbed and prevents growth. This prevents the establishment of root systems that helps bind soil particles together and absorbing water that reduces the erosive potential. 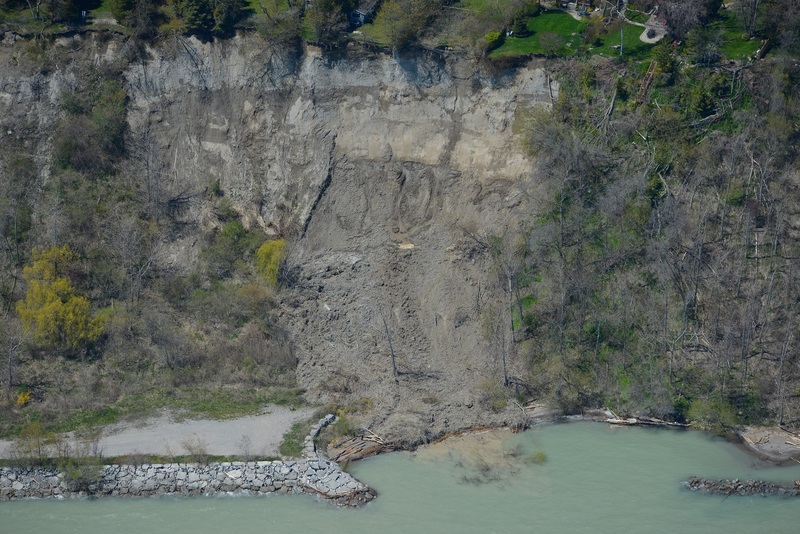 Debris and branches at the top of the Scarborough Bluffs (Source: TRCA, 2015). Some erosion problems are too severe and require fully engineered solutions to ensure long term stability and function. In these cases, TRCA recommends hiring professionals familiar with this type of construction to ensure all relevant environmental parameters are considered, all appropriate permits are obtained, and the work is constructed carefully to minimize surrounding impact. These projects often require input from multidisciplinary teams that include geotechnical engineers, hydrogeologists, terrestrial / aquatic ecologists, civil and water resource engineers, and construction experts. Landslide and shoreline protection (Source: TRCA, 2017).